And this one would be summer, which means the end of school and preschool! We have been working hard on some renovations in the basement; the walls have been repaired and a new concrete floor has been installed. Once we are finished I will have a mud sink, a 4’x4′ work table, plus a long workbench. I look forward to having a larger surface to work with. We are also setting the rest of the basement up as a craft room; the girls and I have grand plans for messy summer activities. In fiber art news, I took a quilting workshop with Hollis Chatelain, where I had a blast and learned so much. I have also joined the Grand Guild of Fibre Artists, and look forward to the fun and opportunities! Lastly, I have finished two quilts. This first one was personally challenging. I am drawn to this arrangement of lines, yet I found it so hard terrifying to turn them into a quilt. Likewise using my doodles as the quilting. That kind of fear usually indicates I am on the right track, baring my soul for others to view. I see this as the beginning of a very intriguing series. I have chosen to call the series Meditations both because minimalist designs such as these are a good focal point for contemplation and meditation; and also because the process of doodle quilting is itself meditative. Then this quilt is the beginning of another series, Arrangements. These are music inspired pieces; this one is inspired by the song I Have Not Been To Oxford Town by David Bowie. I smile every time I walk into the room and see it; it captures exactly the sense of decay, despair, and bewilderment I was going for, with a touch of whimsy and lightheartedness. The poor guy looks so despondent. 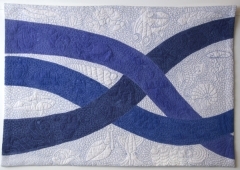 This entry was posted in arrangements, meditations, textile art on June 28, 2012 by dahlia.